Emma Zabloski has been stilting professionally for over five years. 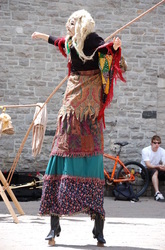 She prides herself in delivering a fun, interactive, and engaging stilt experience to all her audiences. As a member of the Ottawa Stilt Union, a theatre company specializing in acrobatic performances on stilts, she has co-created and performed in three full-length productions. She has also performed at events and festivals all over the National Capital Region, including the Canada Day festivities on Parliament Hill and Winterlude. 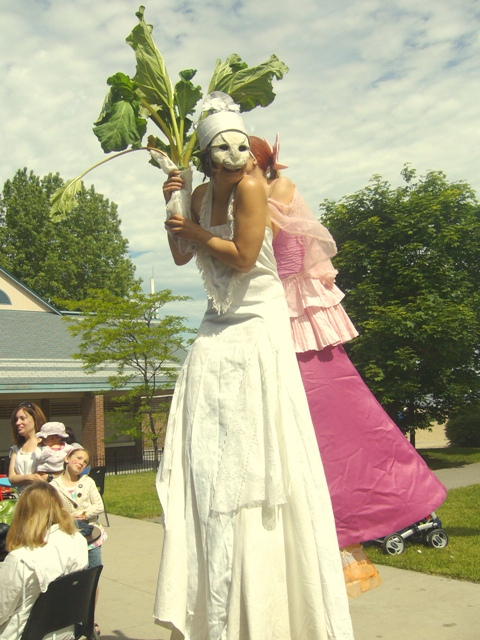 In Victoria, Emma performed as "Big News" as part of Puente Theatre / Merlin's Sun giant puppet project History2Life, appearing at Victoria 150 events and parades all over the city in 2012. She has also taught stilt-walking workshops to youth in Victoria and on Pender Island. Please contact Emma to discuss the nature of your event, stilt character options, and fees. Want to stilt-walk too? Emma is available to teach workshops!